Research into photons emitted from explosions in the far cosmos might be about to prove that everything we thought we knew is wrong. These particles of light, released at the same instant by the collision of stars millions of years ago and hundreds of thousands of light years away, arrive at our telescopes at different times. This might be evidence that the speed of light is not constant meaning that the basis of our understanding of the universe and of time itself could be flawed. Time is no longer constant, not set out before and behind us in a straight line, more lumpy, bumpy and bendy. The consequences of this are beautifully and intriguingly mind-boggling. 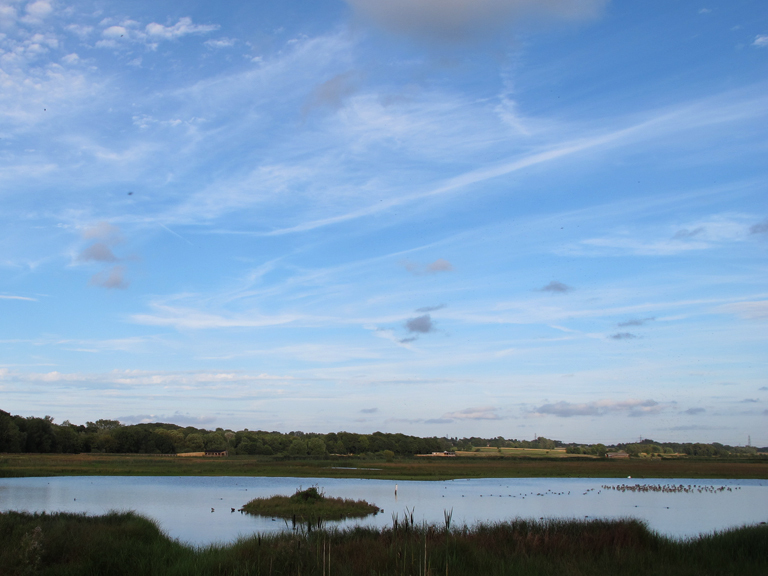 It is time that is on my mind as I look out from the hide at Inner Marsh Farm on this fine September Monday midday. How much time should I spend here? 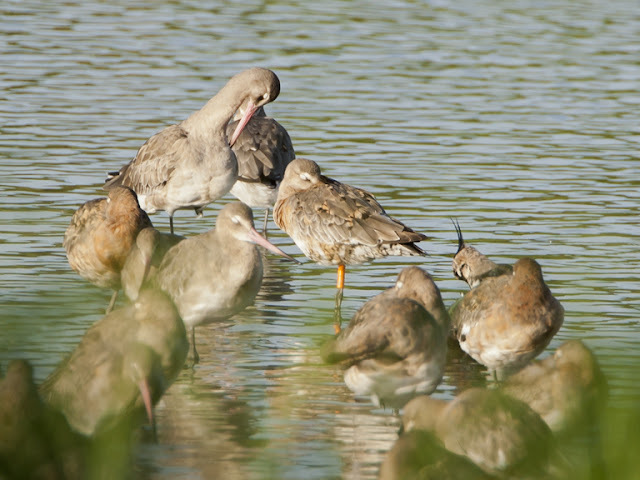 There is a flock of 550 Black-tailed Godwits roosting on a muddy patch in the shallow lagoon that the hide overlooks. How long will it take me to look at each one to see if any are colour ringed? Bear in mind that some are stood on one leg, others are obscured by the feathery bodies of fellow roosters and those not snoozing are feeding in deeper waters with legs, ringed or bare, totally hidden from view. It’s going to take a while. How long can I look down the telescope before my eyes go a little funny? How long before the decaff caramel latte I chugged on the way here signals that I need to visit the bathroom? How long until I have to head home to do all the chores that I have been putting off? 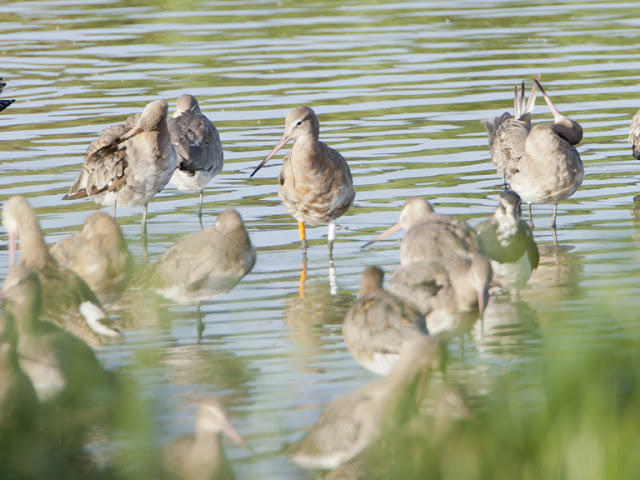 How long can a Godwit sleep/stand on one leg? Time, it’s all a question of time. So I sit and wait, the rubber eyecup of my telescope now moulded to the bony eye socket of my head. I scan through the Godwit flock, count them again, 550 or thereabouts. Working on the basis that between 1-2% of the population are ringed I should find 5 or 6 birds sporting the coloured markers. I can see 2 ringed birds in full so I note down the combinations. I find 2 ringed birds that are stood on one leg showing just half of their code. This happens a lot and never gets any less frustrating. Worst is if the flock is disturbed and they all fly off leaving you with incomplete, and therefore useless, records. I discuss this with a fellow ring enthusiast before he has to leave. His time here has run out for the day. It reminds me that my time here is finite too. The birds look pretty settled and I could use time slowing down to allow me a little longer with them. There are worse places to be stuck for the afternoon and there are plenty of other comings and goings to occupy me. A Greylag Goose washing is keeps me amused for a time. Somersaulting and splashing like a kid in a paddling pool, it gets noisily rebuffed for wetting some of his companions. A Pectoral Sandpiper causes a bit of a fuss for the twitchers. They fill the hide long enough to add it to yearlists before zooming off after the next tick. The sandpiper, unaware of the excitement it has caused, feeds busily between the legs of the taller static Blackwits. How long should I give it to see if I can get the rest of the combinations of the roosting Blackwits? I can’t decide but an answer comes from an unexpected source. 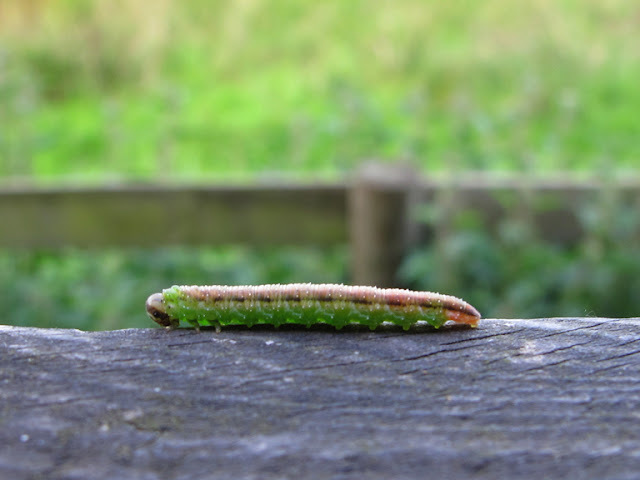 A green caterpillar has started to crawl along the edge of the opening I am peering out from. The window is only around 4 feet long but it must look like a long way to this little grub. With not much else to look at I watch it’s expedition across the woodwork. It is then that I make my mind up to stay until the caterpillar has reached the other side of the window frame. I feel happier now I have deferred the time-keeping to this caterpillar. 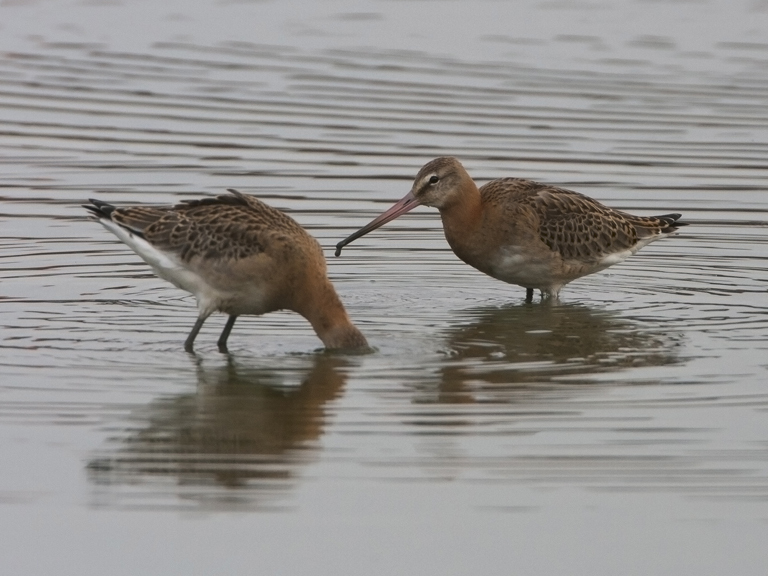 It plods on and I resume my Blackwit vigil. As well as looking for colour rings we also count the number of juveniles in the group so I occupy a bit of time doing that. I count 26 youngsters. 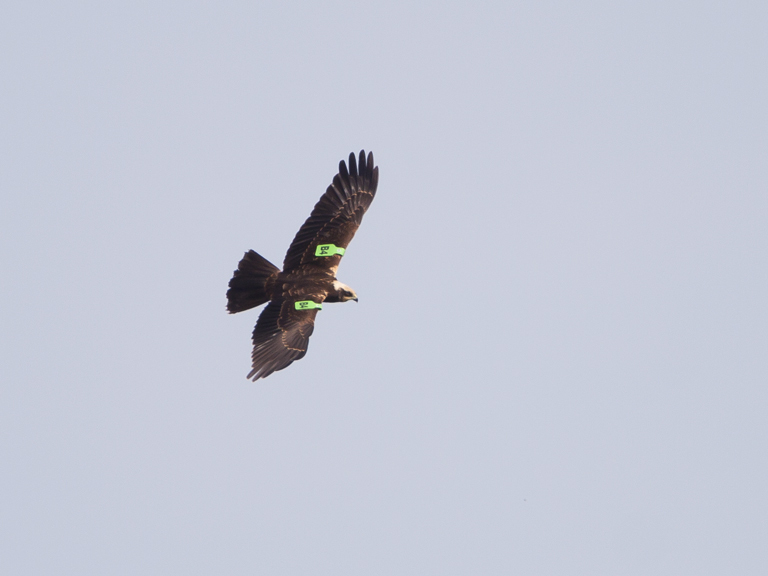 This information will help with understanding juvenile survival and winter distribution. Then at last some movement. I knew it was going to happen; it was only a matter of time. The birds are startled by something and in anxious unison crane their necks to look for danger. They don’t take off, instead they walk about calling to each other. This is just what I was waiting for, the dense flock thins slightly, just enough to see 2 ringed birds I had no idea were even there! Codes quickly noted I look for my two elusive ringed roosters. Success! I now have 6 codes in full, pretty much all you could expect from a flock of this size! I look at my timer, still undulating towards the end of the sill. By my reckoning it still has a good 5 minutes of wriggle time until it reaches the end of the opening, the point at which I can leave. 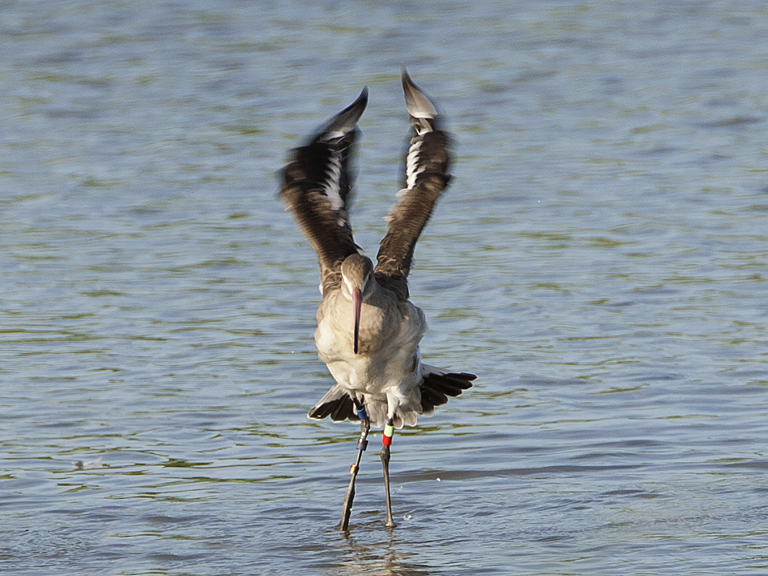 I could just go now, I am pretty certain I have exhausted the Blackwit flock for rings. But I’ve left the time keeping to this caterpillar and I’ll stick to its schedule. I relax for a couple of minutes, reflecting on time well spent, reviewing the data in the notebook and mentally preparing for the chores that await now my Godwitting is done. The reason for the alarm in the birds drifts into view. A juvenile Marsh Harrier is circling over the lagoon. A good sighting, I’m glad I didn’t rush off. It’s probably a bit too far off for a decent photograph but I have a go anyway. Through the viewfinder I see it has wing tags! I fire off enough frames to get the numbers and letter on the tags. Brilliant!